We offer professional photo restoration services for digital images only right now, after your order send us your image via the orange "Send a File" button on the left. If you need any help or have a special request please feel free to give us a call, we are here to serve you there. Where can I get old photos restored? - You are in luck, we restore old photos and serve all 50 US states. We serve almost the entire world, and we are located where ever you are. If you are in a hurry to see your image restored to its rightful glory, give us a call and we can put a rush on it. - We charge per picture restoration fees of $45 for one picture, $37.50 for 2 pictures, and for 3+ pictures it is $30 each. 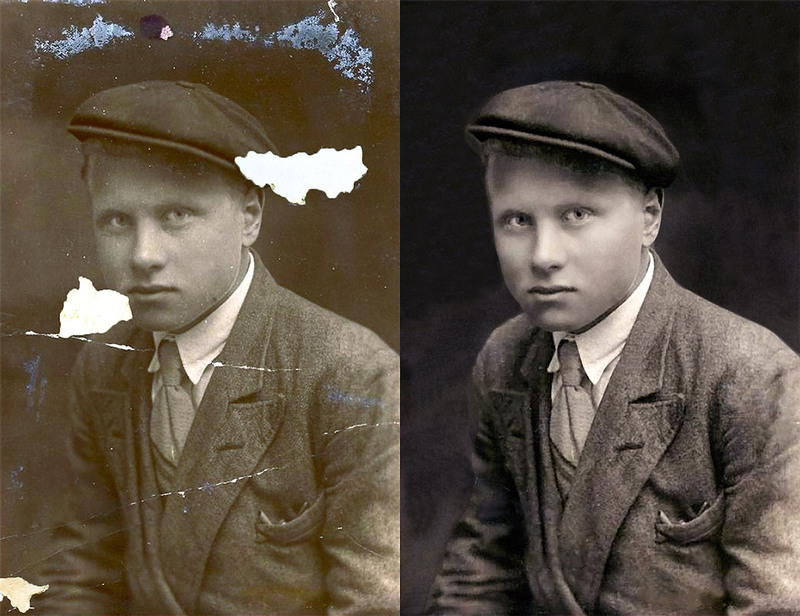 Do you offer restoration on 'hard copy' photographs? - Right now we only offer digital image restoration, but if you scan your image and upload it to us we will get to work. What can I do with my image once it has been restored? - We can mount your image on a variety of different materials. We offer acrylic, brushed metal, canvass, glass, magnetic vinyl and wood. Give us your tired, your poor, your fuzzy images, we will set them free. We will make what once was lost, now is found. You may think you were once blind, but now you see your images beauty. Your 5 x 7 image is professionally mounted on Magnetic Vinyl, Canvass, Brushed Metal, Wood, Glass or Acrylic. Turn that beautiful picture into a scenic portrait. This cost is in addition to your photo enhancement. Your 8 x 10 image is professionally mounted on Magnetic Vinyl, Canvass, Brushed Metal, Wood, Glass or Acrylic. Turn that beautiful picture into a scenic portrait. This cost is in addition to your photo enhancement. This is the smallest size glass mounting we offer. We can have your glass cut smaller, but the edges may be sharp and could result in a cut. If you really need or want a glass size smaller than 10 x 12" you will have to call us and we will have the glass cut down to the correct size. Your price will stay the same, but your glass mounting will be the size you requested. Your 16 x 20 image is professionally mounted on Magnetic Vinyl, Canvass, Brushed Metal, Wood, Glass or Acrylic. Turn that beautiful picture into a scenic portrait and hang it in the dining room. This cost is in addition to your photo enhancement.